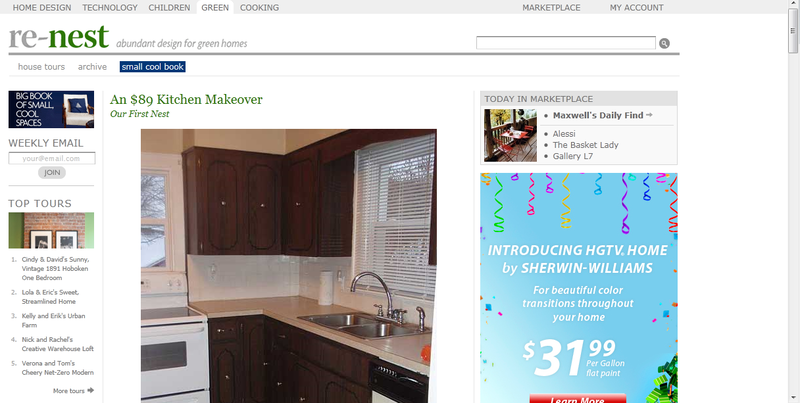 With an obnoxious smile that reached both my ears in place I copied and pasted the link and found that my kitchen makeover had caught the eye of someone over at Re-Nest, Apartment Therapy's green design site. Most of you know I started this blog to keep my family and friends in the loop of the happens going on over here. Most of my readers are family and friends and the occasional visitors that have stumbled upon my little site. I take a lot of inspiration from blogs, design sites, magazines, and the like, and I cannot describe how awesome it is that someone noticed my little kitchen project and felt like sharing it. If it inspires just one person to finally tackle their ugly kitchen by painting what they've got, then I can shut down my blog and die happy. Just kidding, I'm not that dramatic, (although Mike would sometimes say different). What I'm trying to say is, I feel incredibly honored to have one of my projects featured and hope that all the new readers who've stopped by will continue to check back and find enjoyment out of my ramblings. Because, as far as home renovations go, we haven't even begun to get dirty! I found you from the Apartment Therapy link, (your kitchen remodel is amazing) but I became a follower because your DIY tips and tricks are ingenious! Your blog on the Ohio State painting you made inspired me to make my own and I blogged about it linking back to you. I'll look forward to more from your and your new home every week! I love your blog! Just stumbled across it on my second or third visit to Apartment Therapy and was COMPLETELY inspired by your kitchen re-do. We are in the process of buying a home which resembles yours very closely in style and there are so many updates I'm feeling overwhelmed. But when I saw your "new" kitchen, I felt this big weight lift. If ours turns out half as nicely, I will count myself lucky! Off to check out some of your archived posts--thanks again!